Why Do I Get Light Headed After Exercising? After you finish a particularly strenuous exercise session, it's not uncommon to experience a feeling of lightheadedness or dizziness. Symptoms may include feeling as if you are going to faint, weakness or a perception that the room is spinning. Although this condition is not always cause for concern, lightheadedness can make you feel unstable and unsteady. You can take steps to eliminate exercise-related lightheadedness by increasing the amount of oxygen to your tissues. Think of your body like a car. Just as your car requires gas to run, your body requires its own kind of fuel in the form of the foods you eat. When you exercise, your body uses energy stored in your tissues to enable you to exercise. When these energy stores run low, you might experience lightheadedness or dizziness. Always make sure you have "fuel" in your body before exercising. A good way to accomplish this is to eat a 200-calorie snack 30 minutes to one hour before exercising. Examples include half a peanut butter sandwich, cereal and milk or a banana and juice. These foods contain carbohydrates, which are your body's chief energy source. Some medications, including those used to treat blood pressure, can contribute to lightheadedness after exercising. Read the information labels or pamphlets associated with your medications for listed side effects such as dizziness or fainting. Discuss with your physician how you can minimize the effects of these medications while exercising. When you exercise, your heart works harder to pump needed blood to your muscles. This enlarges your blood vessels, allowing them to compensate for the added blood flow. When you cease exercising, your heart may start beating more slowly, but your blood vessels may have not yet caught up. Because of the sudden decrease in circulating blood, your blood pressure can drop. This can lead to feelings of lightheadedness or dizziness. This can be a normal occurrence and typically does not indicate cause for concern. If you do get lightheaded after your exercise session, lie down and keep your head above your heart, which encourages blood flow to the body. If you did not cool down -- performing activities to lower your heart rate --- after your exercise session, you should do this at your next exercise session. 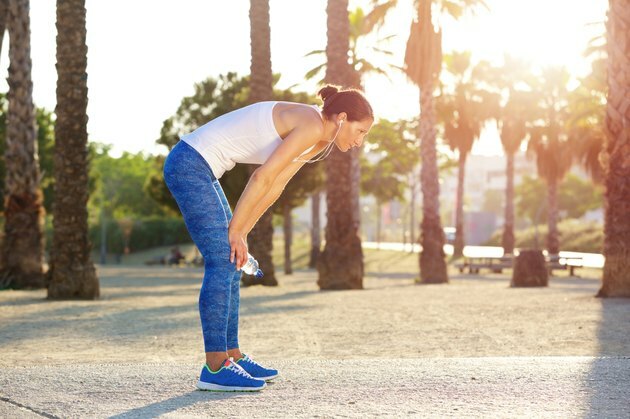 However, if your symptoms continue, see your physician, who can evaluate your symptoms and help to determine if your lightheadedness after exercising is the sign of a more serious condition. Go Ask Alice: Is It Okay to Feel Lightheaded and Dizzy After Running? Why Do I Get Lightheaded During Exercise?